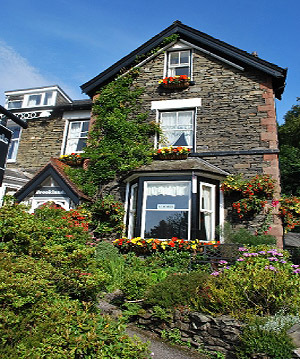 We are a traditional family-run guest house set in a peaceful location on the outskirts of Bowness-on-Windermere in the beautiful Lake District National Park. Built in local stone at the end of the 19th century and with stunning views over the fells and Lake Windermere itself, Brooklands is the perfect place to enjoy a break in the Lakes. We have five cheerfully furnished bedrooms available all with en-suite facilities. All our rooms are equipped with everything the modern traveler would expect – free WiFi, colour TVs with Freeview, tea and coffee making facilities as well as information about the local area. The guesthouse has its own private off road parking available for guests. Our rates include a hearty Lakeland breakfast to set you up for the day ahead (served from 8.30am).